I was half-awake and heard some rustling of sheets and doors opening. I rolled over and checked my phone for the time...5:37 am. Quick footsteps came over to my side of the bed, and I open my eyes to Brad searching under the covers. Me (very sleepily): What are you looking for? Brad: James! Did he sneak in bed with us last night? Me: WHAT?! No. (All sensing springing to full focus.) Isn't he in bed? I leaped out of my bed and raced into his room...turn on the lamp and look. Empty bed. Empty floor. Brad moves some stuffed animals around. Not there. Brad: I already checked the kitchen and living room...the doors are still locked...where is he?! Me: (mind racing...Was he stolen? Did someone kidnap my boy?!) I'll go check. At this point, tears are welling up in my eyes as I am starting to panic thinking James was taken. I'm no Liam Neeson, but Brad...maybe. Brad: (loud whisper) Susan, come here. I head back to James' bedroom. 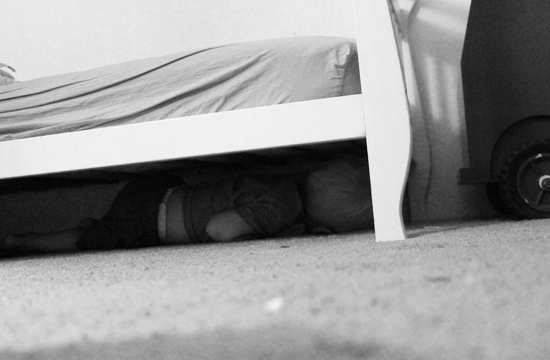 Brad is on his hands and knees peeking under the bed, so I drop to mine. Ahhhh. James. Sound asleep back against the wall under his bed. It has been all of 1.2 minutes. We lifted his bed from its place, settled him back onto it AND moved it back all with a slumbering little boy. What a strange sleeper. Oh my goodness! I'm sure you were just as panicked and he was just peacefully resting.